Get free shipping + 50% off your purchase at Ann Taylor during their Cyber Spring event with the code SPRINGTOIT. Sale ends 3/26 at 3AM ET. I was excited to see if we could shop the new arrivals under the sneak previews section but it looks like they hid all of those items until after this promotion is over. I was also in store yesterday and I saw that they were having an extra 60% off clearance styles. Refer to all of my Ann Taylor reviews here. This Pinterest board also displays all of my reviews visually and if you click ‘read more’ it will take you the my review of the item I pinned. 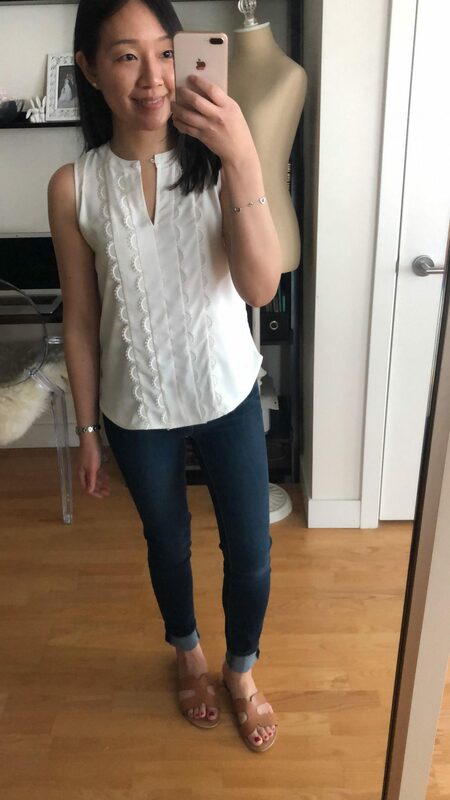 I love the above scalloped top worn alone or under a blazer (see it paired with the c/o bi-stretch modern blazer here) or a cardigan. I took my usual size XSP and I noticed that it also comes in navy. 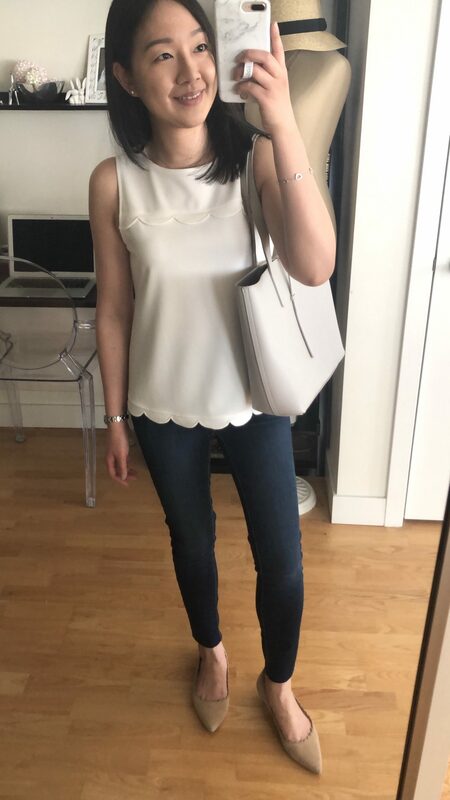 Here is the top styled casually with skinny jeans in the dark enzme wash (last seen here and I ended up cutting them to a 26″ inseam) and comfortable c/o scalloped flats (review here). Note that I personally usually wait for a no code sale to shop for shoes and jewelry (refer to my example sale alert here) since that is when you can stack the latest code for an extra $50 off your full-price promotional purchase of $100+. The no code sales on shoes are not very frequent (the last one was in November) but they have no code promotions quite often for jewelry (e.g. 40% off 3+ items) and $25 sunglasses. 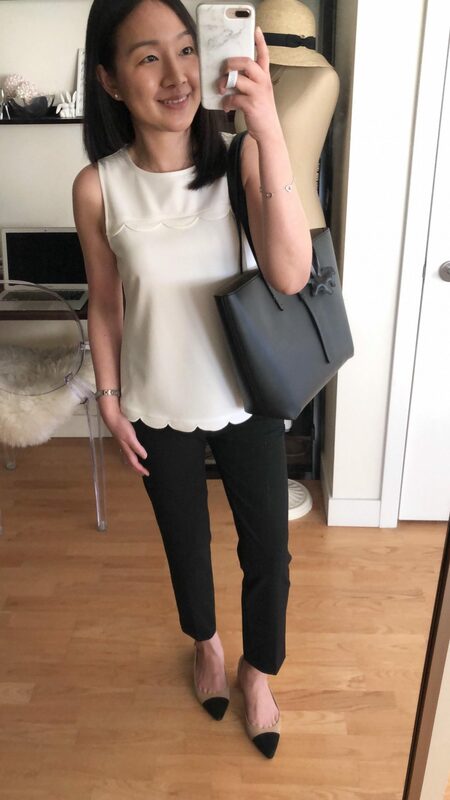 I wore this top to work last week and shared it paired with one of my favorite old cardigans in this post. I took my usual size XSP and it’s not sheer for a ivory colored top. It also comes in navy. 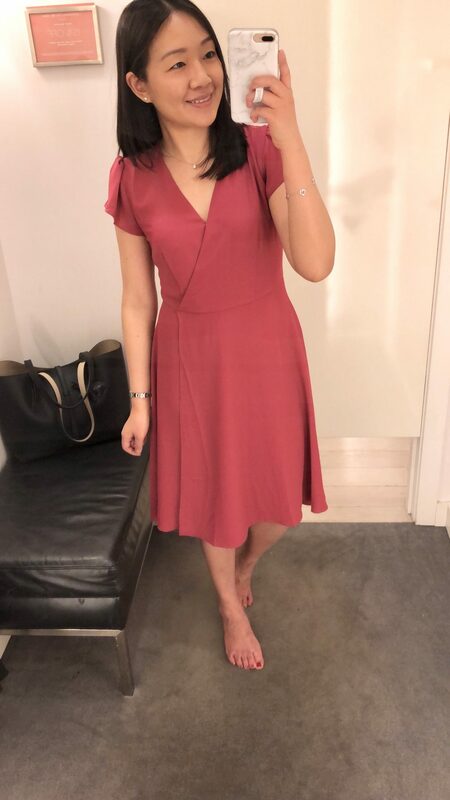 This wrap dress is prettier in person and I quite like the wild strawberry color. I found that it runs true to size and it would be perfect for the upcoming wedding season. I previously tried to try on this dress in this post but I had grabbed size 00P which was too snug. I found my usual size to try on but the hidden snap button is too high so it makes for an awkward fit at the chest as seen here. If I don’t button it then the top is too open for me so I would need to move the hidden snap button. 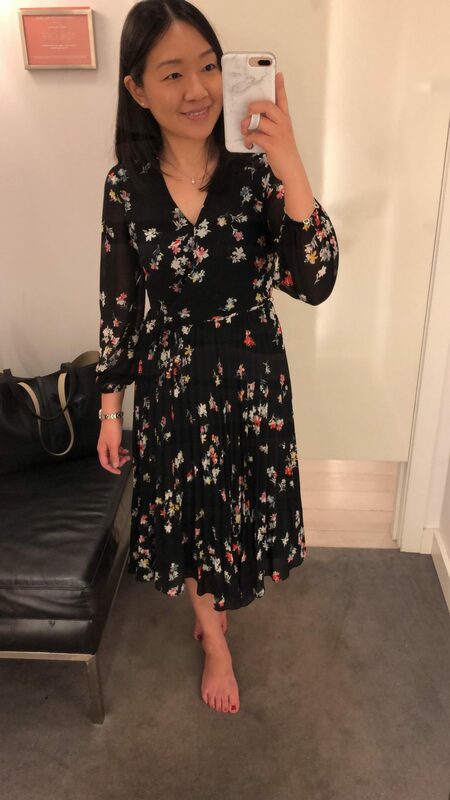 I really like the darker floral print as seen here in the photo that Ann Taylor reposted of @newtexacali. If you’re curious about the new bi-stretch short trench coat in deep carnation this is what the color looks like in person and it reminds me of Bubble Yum pink. I was looking for the light stone version but I didn’t see it at my local store. I also stopped by LOFT and I will share those try-ons in a separate post this week. I believe they will be running a Cyber Spring sale next weekend if they follow last year’s sale schedule which I shared here (which reminds me that I need to check last April’s sales). I’ve noticed that they have never offer 50% off everything during the cash card redemption period which is why 40% off everything and deal of the days (on select select categories with no code needed) are the best promotions they have if you’re looking to maximize savings with the online LOFTCASH code for $25 off $50+. This time around I still have all of my LOFT cash cards (I even gave a few away knowing that I couldn’t use them all) since the petites selection hasn’t been in my favor for the spring styles that I was looking for. I love your blog as always, Jess, but the new layout is very busy and it’s difficult to tell which post is actually the most recent! Thanks so much for letting me know! I just got rid of the featured sliders based on your feedback. I hope that helps and it should now only display my posts in order of the latest new post. This looks much cleaner, at least to me now, and yes, I can easily tell which post is the most recent. Thank you for all you do!